Norm S.’s friend Russ F.
Inspiration was by John P. and involved newspaper humor. 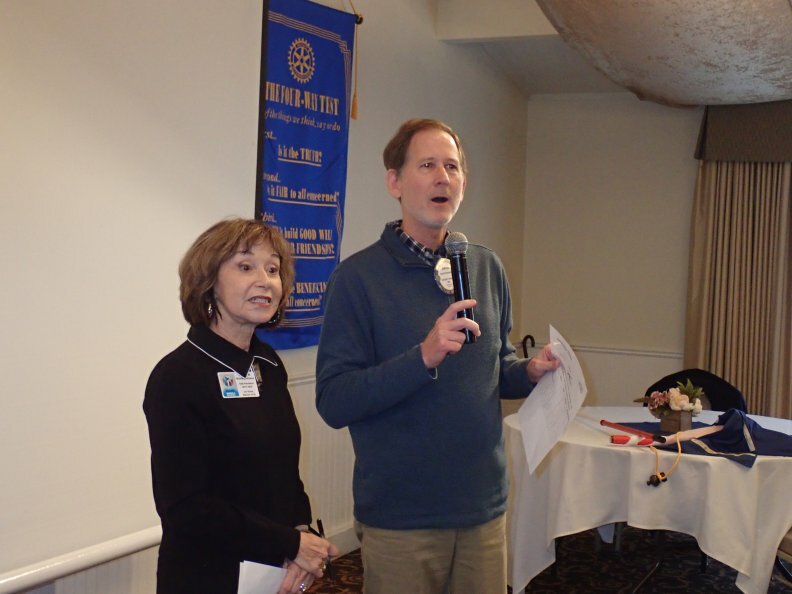 Andrea L. introduced the monthly birthday table where she stated the January birth day of the month for each Rotarian. She got a big laugh when she noted that President Andrew H. was born yesterday. President Andrew H. announced it’s the beginning of philanthropic grant season, that applications are on the club website, and to submit to himself or committee chairs. Henry V. announced he is looking into ordering Rotary gear for the club. He took a vote and discovered most preferred hats with LG Rotary logo, as opposed to Rotary logo only, though will cost a bit more ($15). We will need a minimum 20-40 takers to place an order, so he will be taking names of those interested soon. More gear to come too. Suzanne B. made some CrabFest announcements: Ticket price goes up this Thursday, so buy tickets ASAP. Those wishing to help setup/tear down see Dave K. Get last auction items and your bottles of wine in to Patti v. by this Friday. Still need help for parking lot coordinator, check in help, hanging flyers around town. Marty F. just returned from the Galapagos Islands celebrating his 50th Anniversary with his whole family. He donated $100 and wrung the bell. Nicholas W. celebrated an elegant though early New Year’s Eve with his wife and young children. Hal R. enjoyed a special Puerto Vallarta vacation with family and donated $100 and wrung the bell. Tina donated $20 in honor of her former teacher Florence Bell in attendance. Haryl P. said he’d donate $100 to hear how Tina was back in those days from Mrs. Bell. Mike F. thanked the club for ongoing support for the Veteran’s Memorial and announced they broke ground Saturday. The project should take 6 weeks, barring weather issues. He also thanked the club for the Fisher House Holiday Philanthropy. He was able to give out $3000 in gifts to the veterans getting care there. 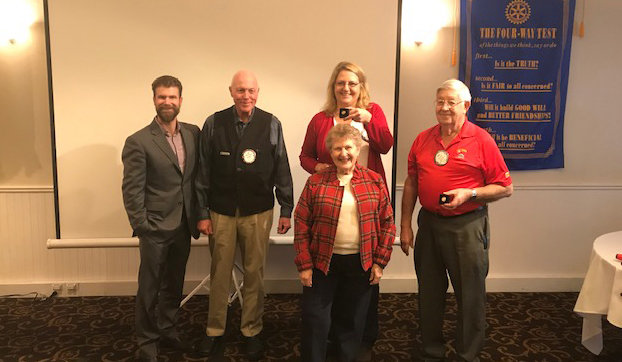 Avis handed out Paul Harris pins to Patti v., Ron C. and Ed B.
Today’s speakers were Rotarians Ron C. and Ed S. They completed a trip touring the Pacific Islands of WWII last March. The tour was only open to veterans. They presented a sobering and fascinating trip with much history and a little humor thrown in. Ed explained he was looking for a travel buddy so enlisted Ron as his man servant. That got a chuckle. Islands toured included Saipan, Guam, Iwo Jima, Okinawa, and Tinnian. They attended a Reconciliation Ceremony at Surabachi Mountain. Ron was setting off on a difficult hike for a better view, while Ed stayed back. Ron was soon passed by Ed in a Jeep that he sweet talked a general into driving for the same view. Ed is a good friend to have! Slides were shown of the bombs, planes, and runways used for the Nagasaki and Hiroshima atomic bombs that brought untold devastation but also an end to the ongoing war.